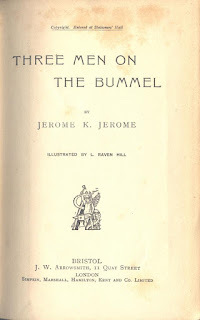 One of the luckiest categories to show up on this year's Back to the Classics Challenge was "A classic travel or journey narrative, fiction or non-fiction" because I have had Jerome K. Jerome's Three Men on the Bummel (1900) sitting on my shelf for years. I had heard it wasn't quite as good as Three Men in a Boat and so I was a bit nervous about it. I shouldn't have been, of course. While JKJ takes some strange tangents and has some oddly prescient thoughts about German politics, it still had tons of laughs and scenes that felt all too familiar, even 118 years later. 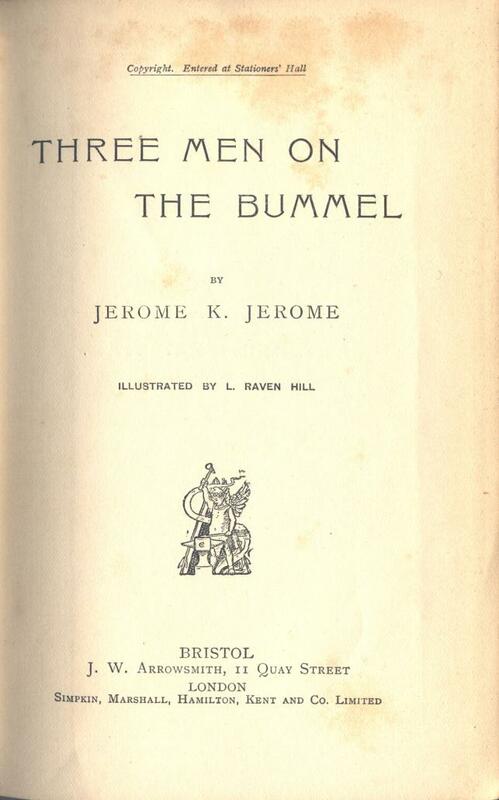 So, bummel -- JKJ says "A 'Bummel' ... I should describe as a journey, long or short, without and end; the only thing regulating it being the necessity of getting back within a given time to the point from which one started." This description is literally given in the last paragraph of the story, almost as if the characters could only describe their journey once they had finished it. What was that journey? A trip by boat, bicycle, and train for the three friends--J, George, and Harris--as they escape their wives and children in England and explore eastern Europe. I definitely think this book makes more sense if you read the previous one first. Boat spends more time establishing the personalities and tendencies of the characters than Bummel and therefore enhances the humor. I still liked this book slightly less but mostly just because I am more interested in the Thames than I am the Black Forest. Have any of you read anything else by Jerome K. Jerome? All of his works seem to be available but I wouldn't even know what to try next! Oh, man, I too have been meaning to read this for years, and I too am nervous about it. I'm so glad you enjoyed it and I WILL do it! Sometime....it's an ebook and I'm really slow with those. I think I have Diary of a Pilgrimage (as an ebook), or maybe it's the one with Calvary in the title -- it sounds religious and I'm a bit nervous about it too. I thought it would suffer even more having reread the first book just a couple of weeks before but it didn't. And I'm always nervous when someone has *one* well-known book but a whole catalog of works ... is that for a reason?! I finally got around to this one last year. I did enjoy it but didn't find it quite as memorable as Three Men in a Boat. I've also read Diary of a Pilgrimage, (about a train trip through Germany to Oberammergau), and a few years ago I found a copy of Tommy & Co for 5 euros so I couldn't resist though I have no idea what it's about. Expectations are a reader's biggest foe!